Going to the Bremerton Raceway and We're Going to Get Married! 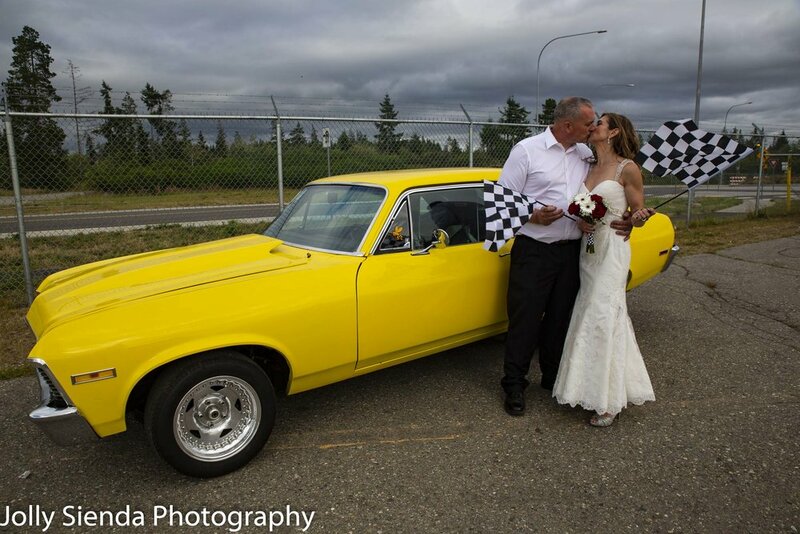 On June 30, 2018 Joe Graham and Cathy Darlington Strong married each other surrounded by love, family, friends, and race cars! It was a romantic, energized, ceremony and party complete with Joe's yellow race car, black and white checkered flags, a tool box, and red roses! Everlasting love sealed with a kiss! Cathy and Joe had their First Look before the ceremony. You could feel the love in the air! Cathy dazzled the crowd in her beautiful wedding dress! At 7 pm the races stopped as Cathy and Joe said their vows on the race track! I give you this ring Cathy and my love! Our sincere congratulations to Cathy and Joe! Thank you for allowing Rich and I to be a part of your wonderful celebration! Best wishes!! !